Experience the Treasures of Turkey with smarTours on our fourteen day, comprehensive tour of this incredible country. 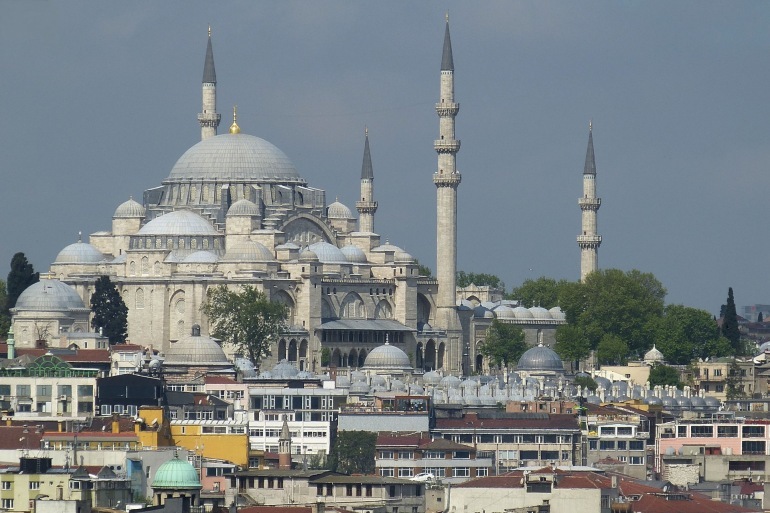 Known as the “Crossroads of Civilizations”, Turkey is a vibrant country with a rich history. On this seven-city adventure, your journey provides breathtaking landscapes, striking and bizarre rock formations, Turkey’s fabled Turquoise Coast, the classical city of Troy, among a variety of other incredible features. Visit The Grand Bazaar in Istanbul, The Acropolis in Pergamum, a seaside escape in Antalya, historic Topkapi Palace, and much more. Your fascinating tour of Turkey, the “Crossroads of Civilizations” begins as you depart on overnight flights to Istanbul. Upon arrival when you visit Istanbul, you’ll be met and transferred to your centrally located hotel. This evening your tour director hosts a welcome dinner and orientation. Situated at the meeting point of Europe and Asia, Istanbul offers a fascinating blend of east and west. Your guided morning tour includes visits to St. Sophia, the great Byzantine Basilica built in the 6th century. Your tour ends with a visit to the vast and bustling Grand Bazaar, world famous labyrinth and passages housing numerous stores where you’ll have shopping opportunities galore. The balance of the day is at leisure and you may wish to join a leisurely cruise on the Bosphorous. Depart for the Turkish capital, Ankara, the country’s second largest city. Upon arrival, visit the Mausoleum of Kemal Ataturk, founder and first president of the Turkish Republic. Leading up to the Mausoleum, is a vast brick courtyard and monumental avenue lined with Neo Hittite stone statues and cenotaphs beneath its colonnades. You will also visit the fascinating Anatolian Civilization Museum. The balance of the day is at leisure to explore on your own. Today, travel by road through the Turkish countryside to the world-renowned region of Cappadocia, a breathtaking landscape with striking and bizarre rock formations and underground cities. On today’s guided excursion, visit the Open Air Museum in the Goreme Valley to view early Christian churches decorated with beautifulfrescoes depicting various scenes from the Bible. You’ll also visit the Kaymakli Underground City, which was hollowed out of volcanic rock and extends seven to nine floors deep into the earth. It is made up of a maze of corridors, chambers, storehouses, kitchens and churches. Finally, visit the village of Avanos, famous for its beautiful old houses as well as pottery and onyx workshops. This morning visit the 13th century Sultan Han located at a secluded point on the ancient Silk Road between Aksaray and Konya. It was used as a caravanserai during the Seljuk period when trade flourished, requiring roads for caravan transport and inns for the traveling traders and their camels. Continue your journey by road via Konya, passing through lush forests, orchards and olive groves on the sloping hills downward to the splendid Mediterrannean Sea. Full day at leisure to enjoy at your own pace. Your seaside resort hotel enjoys a choice location overlooking Turkey’s fabled Turquoise Coast. You may join an optional tour ($63) to ancient Perge, the most attractive and well-preserved Pamphylian city that reached its apex during the reign of Alexander the Great. Continue to Aspendos, founded by the colonists from Argos and best known for its huge theater. On this optional tour you’ll also visit the Antalya’s Archaeological Museum that houses artifacts and antiques from 2500 years of Anatolian culture. Journey to Pamukkale and visit the Necropolis and the ancient city of Hieropolis (“Holy City”), situated atop the Pamukkale hot springs. These hot springs have served as a thermal bath since the 2nd century B.C. Later, arrive in Izmir, believed to be the birthplace of Homer. Today, venture to explore Ephesus considered to be the world’s best-preserved classical city and famous throughout history for its Temple of Artemis, one of the Seven Wonders of the ancient world. Ephesus was undoubtedly one of the most important cultural centers of the ancient world and among its impressive structures you will marvel at the Library of Celcus, Temple of Hadrian, the Great Theater and the Odeon. Later, visit to the House of Virgin Mary, a shrine said to be the final home of the Virgin Mary near Ephesus. Return to Izmir. This morning, marvel at the classical city of Troy as you tour this 4000-year-old city and legendary center of the Trojan War, made immortal by Homer’s epic poem the Iliad. Cross by ferry the Dardanelles, a narrow strait connecting the Aegean and Black Sea and arrive in Istanbul. Upon your return to Istanbul, you may delight in a visit to the Spice Market, the exotic food market selling dried fruits and spices, the underground cistern, the water source of the Byzantine and Ottoman periods. This evening savor an included festive farewell dinner. On a guided morning tour, a local expert will introduce you to some of the highlights of the city, previously known as Constantinople and the seat of the Eastern Roman Empire. Visit the splendid Topkapi Palace, the residence of the Ottoman Sultans for almost 600 years and now a fascinating museum. Here, visit of the Treasury section with the crown jewels and the unique collection of Chinese porcelains. Continue to the ancient Hippodrome, the place chariot races and competitive athletic events took place during the Roman period and finally, explore the elegant Blue Mosque, a 17th century Ottoman Mosque famous for its six minarets and magnificent interior with blue tiles. The balance of the day is at leisure. Today we bid our tour of Turkey farewell. Your exciting journey concludes as you arrive New York. Round trip airfare from New York (JFK), except for the June 11th departure, which is a Land Only Special date at $1399!